MSHS has hired a new Garden-in-a-Box Program Coordinator. Join us in welcoming Maria Brosofske! She will be contacting previous program participants in the coming weeks. The 2019 program application form is now available through April 6, 2019. Visit the How to Apply page to review the program requirements, then apply through our online form. This application is for potential new and returning program participants. This program is funded through foundation and corporate grants, as well as individual gifts. Find out who supports the program and how you can help. Resources for Garden-in-a-Box program participants. Harvest record, tasting journal, recipes and vegetable gardening information. Read about some of the groups who have participated in the Garden-in-a-Box program over the years. 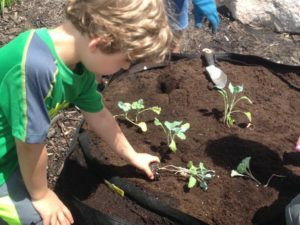 Almost 400 vegetable garden kits are planted by over 80 organizations across the state of Minnesota every year. We are providing gardening opportunities and fresh food to over 3,500 youth and members of low-income families.